The Riviera Nayarit Convention and Visitors Bureau received a 2014 Bronze HSMAI Award for its work with the TV show The Bachelor Canada, which was filmed in the Riviera Nayarit—the perfect spot for the series’ romantic angle. The Hospitality Sales and Marketing Association International (HSMAI) Adrian Awards celebrates excellence in travel advertising, digital marketing and public relations. In 2014, the Riviera Nayarit Convention and Visitors Bureau (CVB) received this award for the second time through its North American public relations agency, M Silver. 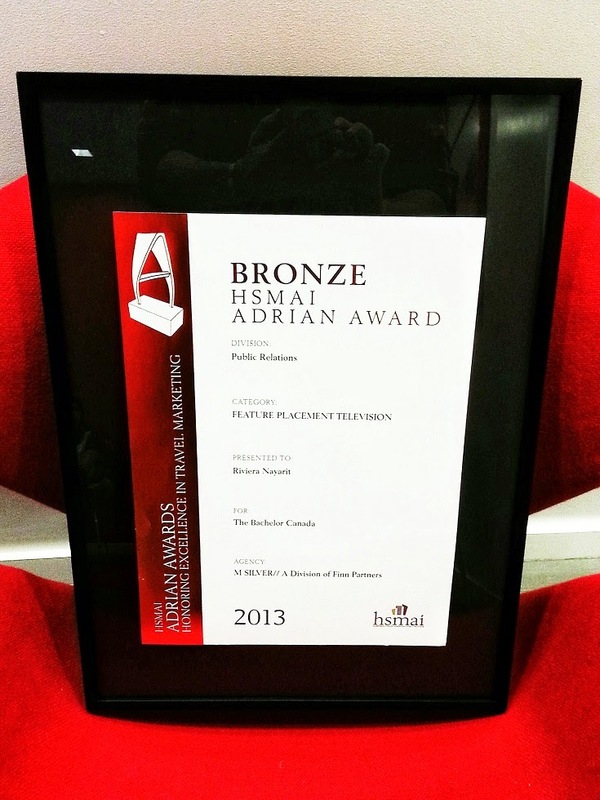 On this occasion, the destination was awarded the 2014 HSMAI Bronze Award for the third episode of the first season of The Bachelor Canada, filmed in the Riviera Nayarit, which served as the perfect showcase for the romantic series. The program was produced in May 2012 on the grounds of the Grand Luxxe of the Mayan Resorts Nuevo Vallarta, as well as the areas of Nuevo Vallarta, Sayulita, the Marina Riviera Nayarit, La Cruz de Huanacaxtle and the Marietas Islands. The Bachelor Canada reaches 10.7 million Canadian viewers a year. The main viewers demographics shows they are aged between 25 to 54, enjoy high purchasing power, like luxury hotels, adventure, leisure and a balance with nature—exactly what the Riviera Nayarit has to offer. The HSMAI Adrian Awards honors the best marketing campaigns focused on hospitality, travel and tourism industries around the world. This year’s contest attracted nearly 1,100 participants from over 30 countries, making the HSMAI Adrian Awards the most prestigious in the hospitality industry. In 2009 the destination received the HSMAI Silver Award for the placement and presentation of “Mexico’s Newest Destination” in the consumer newspaper, USA Today. These results are obtained thanks to the impetus of the CVB that creates active and purposeful initiatives, hires the right candidates for the job and is continually seeking to exceed its goals with a winning vision firmly in mind. The Riviera Nayarit congratulates M Sliver/A Division of Finn Partners for its excellent results during the seven years it has represented the destination. In 2014 alone it received a total of 17 awards and recognitions for work completed in 2013.